Cal Fire has hired a new chief to head the San Luis Obispo County Fire Department. 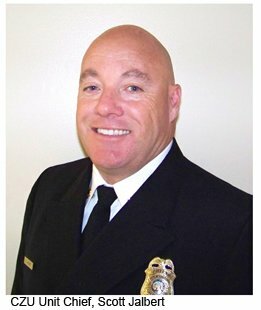 Scotty Jalbert, currently fire chief of the Cal Fire unit that serves Santa Cruz and San Mateo counties, will take over duties in San Luis Obispo County on April 1. SLO County has contracted out fire services to Cal Fire since 1930. The San Luis Obispo County fire chief is currently responsible for overseeing fire services for the county, as well as for the city of Pismo Beach and the communities of Los Osos and Avila Beach. Additionally, SLO County’s Cal Fire unit serves the community of Cayucos during non-fire season. Former chief Robert Lewin retired in December. Lewin then took a position in Santa Barbara County’s Office of Emergency Management. Both SLO County Administrative Officer Dan Buckshi and Pismo Beach City Manager Jim Lewis had significant input in the decision to appoint Jalbert, a Cal Fire press release states. Jalbert began his career with Cal Fire as a SLO County firefighter in 1987. Shortly afterwards, he joined the San Mateo-Santa Cruz fire department and rose the ranks to chief. Currently, Jalbert is also a fire instructor for the City College of San Francisco. He has a fire control vocational teaching credential. Jalbert will oversee approximately 180 state employees who operate the SLO County Fire Department. They are supplemented by as many as 100 seasonal state firefighters, 300 county paid-call and reserve firefighters and 120 state inmate firefighters. The Cal Fire news release did not state what Jalbert’s salary will be. Granted the county and city are different fingers of the same hand. Frankly shining the spotlight on a disgraceful firefighter and the vicious conduct Mr Mason has repeatedly been reported to have engaged in is well worth letting a couple of folks made snappy comments. The prior Chief had months and months of vacation, and sick leave accrued. In fact, tax payers are paying for two Chiefs thru June! And we are paying it at his salary level when he retired not a the salary level when the time was accrued, and likely more than permitted. It’s the government way…. Hopefully he will fire Mason. I cannot and will not support the SLO Fire Dept while Mason remains in their employment in any way. Hiring him back most likely reinstated all his old benefits, whereas when he was terminated for cause we were rid of him AND off the hook financially. The fire departments really need to do some major public image repair! Now THAT I would like to see. A state Chief overseeing county fire services firing a CITY firefighter. Mason works for SLO City. Jalbert is SLO County Fire Chief. Don’t forget that we also probably paid for his move down here and padded his pocket book to buy a new home. This is very common in government that when you get ready to retire, and if you are at the top, you transfer to where you want to retire and the move is free gratis. I don’t know if this is the case but the terms of employment would be interesting to see. Have to agree with isoslo regarding the time of employment and will probably retire in a year or two. It’s just our tax money.